The Aeolian Islands are a volcanic archipelago in the Tyrrhenian Sea north of Sicily, whose name derives etymologically from the demi-god of the winds. 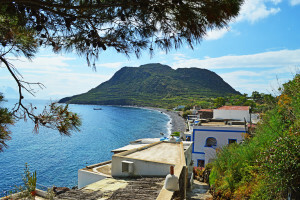 The Aeolian Islands are a popular tourist destination in the summer, and attract more than 200,000 visitors a year. 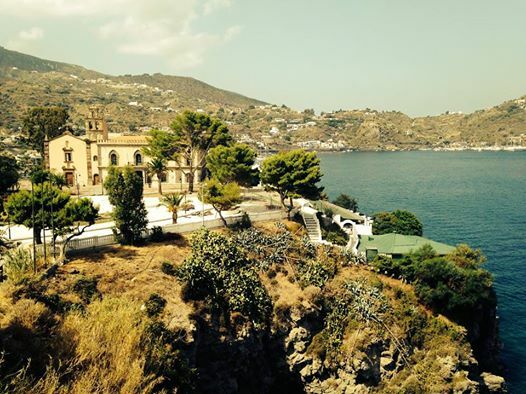 The largest island is Lipari, the other islands, all beautiful and each with its own peculiarities are: Vulcano, Salina, Stromboli, Filicudi, Alicudi, Panarea. 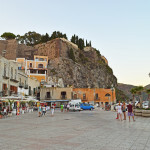 Lipari is the ‘main island in the Aeolian archipelago; This beautiful island offers a wonderful walk towards the south of the island, allowing you to admire the high citadel, from where you can enjoy a breathtaking view of Vulcano and Salina. To the north of the island you can see the exploitation of pumice around Mount Pilato Porticello. These flows of pumice almost sandy (although less than 10 years ago) gives you the descents of about 200 m pumice going to break over the sea and that give the landscape a white ever seen. Lipari not only has an interest in volcanology and / or tourism, but is also a center for the discovery of prehistoric archeology and Greek and Roman. 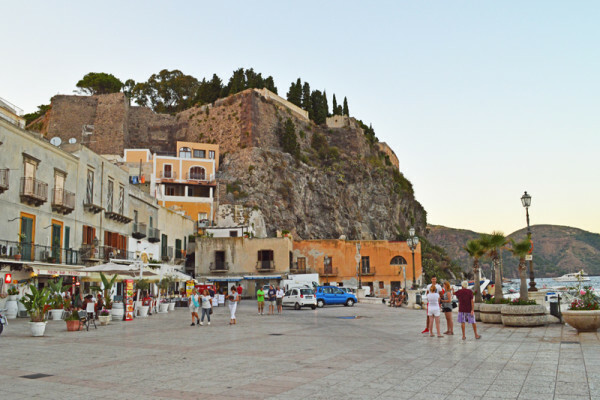 Repeatedly changed over the centuries, the ancient acropolis of Lipari, the fortified castle, built on a lava rock cliffs that separates the two bays. The Museo Archeologico Eoliano is near the cathedral built by the Normans. Finally, it is impossible to leave this beautiful island, without a stroll through its streets and buy some souvenirs typical of the region: the most typical products are the Malvasia delle Lipari and the famous capers. The island of Vulcano is unmistakable for its sulfurous odor that invades the port; the mud baths are not very far indeed. Many recognize the health benefits of “hydrotherapy”. The volcano has never ceased to demonstrate its vitality and even today, such phenomenons. Linger around the Great Crater is exciting for several reasons. Here you can quite easily reach the summit of the volcano.The observation of ancient volcanic bombs are worth a long walk of about an hour had to go to the summit, from which you can admire the island of Lipari, Salina and Vulcanello. Another interesting beach is dell’Asino the other side of the island near the village of Gelso; Also the town is very pretty full of shops, bars and restaurants. The beautiful beaches, the sea water of exceptional purity and the sun made it a special place of tourism in this region. 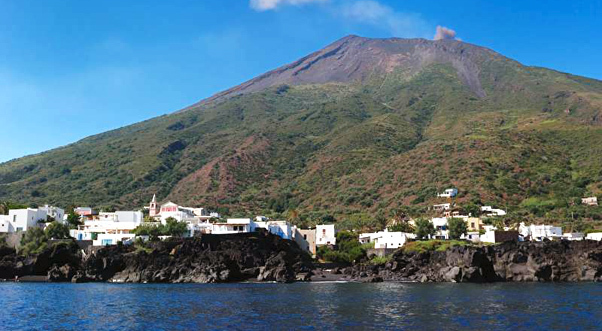 Stromboli is one of those islands that can be defined “do not miss“. Stromboli is nothing but a still active volcano that emerges from the waves and rises to 923mt., Its base is located at 3000 meters below the sea surface. 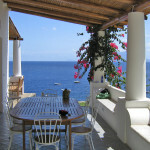 Stromboli is also known as the Lighthouse of the Mediterranean. In fact, when in a state of eruption, in the past it became an important reference point for boaters Greek and Etruscan, and once spotted meant that Sicily was near. In the village, life does not seem to be changed, the only road is cluttered with motorbikes and wasps.The island’s vegetation consists of broom, capers, olive trees and prickly pears. The sun is generous, the beaches are black sand. During the night in Stromboli, you will discover the splendor of the explosions of lava and gas jets, which make this island a memorable spectacle. Further down the houses of the village of Stromboli, dazzling white, from sea to the foot of the volcano, around the two churches of St. Vincent Ferrer and St. Bartholomew. 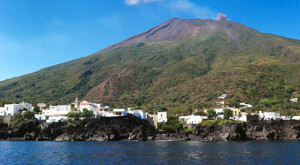 For those who climbs to the top of Stromboli can enjoy the rare charm of the Sciara del Fuoco, which during the explosions, you will observe this bed of lava that reaches the sea from Sciara. Salina, consists on two mountains that meet in the valley of Valdichiesa, observing them from a distance, you can easily understand why it was called “Twin” (Twins), because in fact seem divided into two almost equal parts. The two volcanic cones covered with vegetation are the attractive profile of Salina. Here everything goes quietly and peacefully, tourism has not created any major change on the island and any change was always in touch with the surroundings. An ideal place for hikers who will find beautiful corners, between Santa Marina, Malfa, Leni, Rinella (particularly striking with its fishing village and its many natural caves of tufa), Pollara, Language and Valdichiesa. Upon arrival at the port of Santa Marina Salina (you can also get to Rinella), it feels right now the quiet atmosphere of the island. Salina has among the major tourist landmarks, Pollara and Language, has among its delicious nature reserves, and finally the beaches, some large stones or black sand, made of lava. For lovers of travel between sea and vegetation, forests and small quiet beaches, Salina is the place. Panarea is considered the coolest of the seven Aeolian Islands and is the smallest island of the archipelago. And ‘particularly renowned for its limpid waters. Panarea is on a more or less circular underwater platform, and it provides an area that can be considered unique, with a steep profile full of coves, pristine beaches and reefs. To do definitely climbing up to 421 meters of Pizzo del Corvo where you can then tovare hospitality in small towns like Iditella, St. Peter and Drautto, known for the summer holidays. Places definitely the incomparable charm of Cala Junco, where they were found and brought to light the oldest archaeological finds from all over the archipelago consists of a circular hut village that open to a small bay for ships, hydrofoils, boats and fishing boats; while the small hill overlooking the island you can admire the Basiluzzo and Stromboli. The harbor area offers some delicious local shops, bars, restaurants and one of the most beautiful in Italy the “Raya”, where you will enjoy wonderful aperitifs and fantastic sunsets. 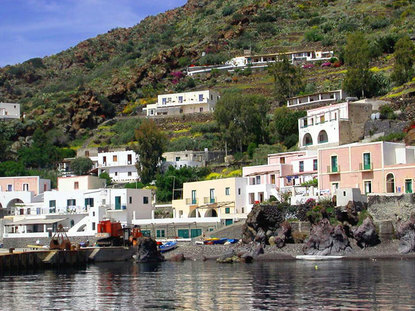 Filicudi, is the penultimate island in the northwestern part of the archipelago, offers lush vegetation rich in ferns, from which it derives its name. Its central point is the Monte delle Felci (Mount of Ferns), reaching 774mt. In the south-east lies the pretty little peninsula of Capo Graziano. 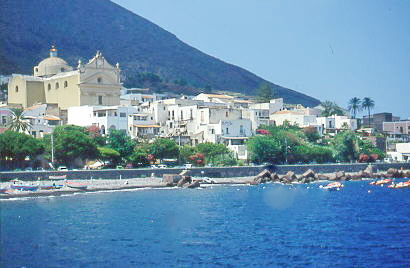 Its villages are three: Filicudi-port, Pecorini and Valdichiesa. The cultivation of capers is still flourishing at this time and are one of the most typical products of the area. Fishing for lobster, sea urchins are plentiful. Filicudi is by many people called “the magic island”, and the lack of public lighting that creates a unique atmosphere that allows you to enjoy a starry sky that seems to exist only here, is definitely one of the reasons. The sense of peace and quiet offered by the climate, the scenery and the people and at the same time the festivals and events that take place in an atmosphere of absolute tranquility, make this island a real paradise. Alicudi is the westernmost and most isolated of the Aeolian Islands, can be suggestively called a natural retreat for peace and silence. Its population was almost forced to find natural shelter in small houses built on terraces, halfway up, overlooking the eastern side; you can still enjoy today a simple and primitive life, among people who are always ready to welcome you with a smile of hospitality. Alicudi is the second smallest island of Panarea after, the difficult access will offer an even more particular fascnino making the island the most pristine and primitive sects. The paths that cross it are obsolete and rather difficult to cross. Among the narrow inlets of the island, some are hidden beaches, quiet, calm, shallow water and the vitality of flora and fauna. Beautiful tour of the island by boat, which takes visitors also the western part of the island, beautiful, with a deep blue sea and deep, with skiing and columns of volcanic lava rock sticking out of the sea, the so-called wire.